Dr. Archibald D Hart 's Sleep, It Does a Family Good is by far the best guide I've read to date about sleeping and its effects on health. In today's fast-paced society, sleep has been casually cast aside as unimportant, when in fact, neglecting sleep is very dangerous to people's health and can also negatively impact relationships, families, and marriages. With Sleep, It Does a Family Good , Dr. Hart has created a well-crafted and simple-to-read informative health guide on sleeping and how it is crucial and essential in leading a full, rich, and satisfying life. Many people today believe that napping and sleeping are self-indulging signs of mental weakness; whereas Dr. Hart assures us that these misconceptions will shave years off our lives by causing increased stress and generating lower levels of happiness. Dr. Hart also teaches readers strategies on how to overcome worries and anxiety while trying to fall asleep at night, which is ultimately helpful since the majority of people are impacted by this obstacle. From mastering sleep patterns, overcoming spousal sleep barriers, and to educating on sleeping pills, Dr. Hart leaves no stone unturned on the subject of sleep. Sleep, It Does a Family Good is wonderful and informative to read because sleep really is more important than people give it credit for. Society's neglectful views toward sleeping and the popular quote along the lines of "I'll sleep plenty when I die" is too dangerous, and just adds to more common existing health risks such as obesity and poor eating habits. 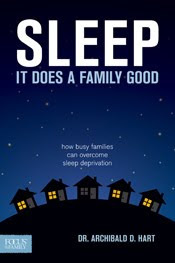 Another benefit of Dr. Hart 's book is that he explains how poor sleeping habits will affect family growth and marriages. I recommend this book to EVERYONE, especially those who are looking to enhance their health and well-being. Excellent book, and I intend on keeping Sleep, It Does a Family Good in my personal collection to share with friends and family.